It wasn't until tonight that fellow creator Kovah and I came up with the name of the world and the landmasses, even though they've existed in the story for quite a while but once we had names one thing led to another and here we go. 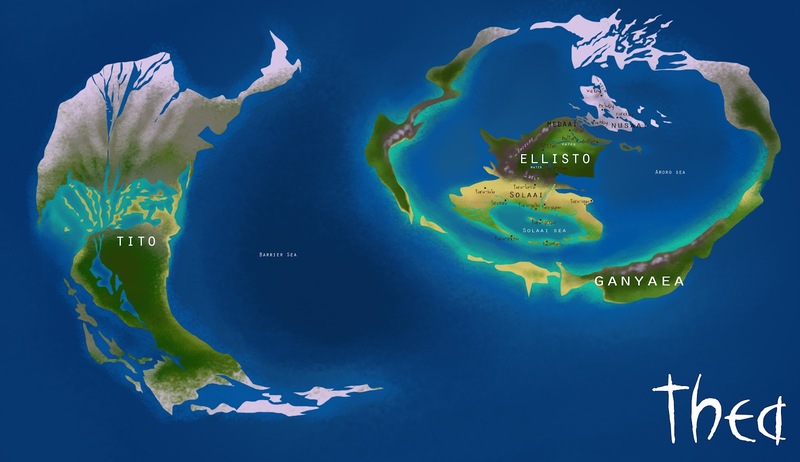 The naming here is actually mostly what the southerners have called everything as most of the action occurs on Ellisto and they're the main explorers and book keepers so they get to pick ;). The Titoans probably use very similar names considering the southern ancestors first sailed from Tito to colonise the southernmost parts of Ellisto. No one knows what names the Ganyeans use because no-one's really had the chance to have a chat with them.